The Glen Carbon Heritage Trail was dedicated to Ronald J. Foster Sr. in 1991 in recognition of his meritorious service to the Village of Glen Carbon as Trustee from 1965 to 1981 and Mayor 1981 to 2001. His dedication and outstanding contributions to municipal government covered a span of three decades and will be forever remembered. The trail features 11 miles in length with Mile/kilometer markers, oil and chip merimac gravel surface, parking areas, trail maps, historical markers, restored prairie areas, and restrooms along with water facilities. Hours: Dawn to dusk all year round. For more information about our bike trails, please visit Madison County Transit Trails. MCT has converted over 75 miles of rail corridors into user-friendly bikeways and walking trails, which also links with its transit system. It is the only bike system in the country to create such an integrated transportation system. MCT has equipped all of its buses with bike racks to provide accessible connections between the MCT bikeway and bus systems. Residents of Glen Carbon have a variety of options when finding places to spend time with their family and friends, enjoy group gatherings or watch a sporting event. 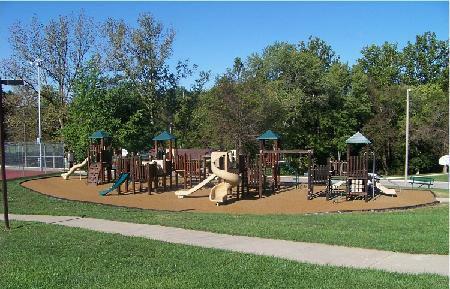 Three parks in the Village offer relaxing locations to enjoy just about any activity. Groups wanting to hold special functions and reserve areas in any of the parks need to obtain a form from Village Hall or click here for the on-line form, complete it and submit it to Public Works for approval. Ray M. Schon Park was opened in 2013. Located on a beautiful rolling tract of greenspace across from Glen Carbon Village Hall on Main Street, the park is a work-in- progress, serving visitors and residents alike. With pavilions, benches, a walking trail and pond within its limits, Ray M. Schon Park is a perfect spot to rest, relax and rejuvenate. Greenspace North is a 34 acre conservation area that includes a hiking and bike trail immediately to the west and across the street from the Glen Carbon Village Hall, 151 N. Main Street. The park features public parking, access to the Madison County Transit Nickel Plate Bike Trail as well as a beautiful nature walk within its boundaries. The Park was officially dedicated in October 2007. If you like nature, walking and a whole lot of clean, fresh air you may do yourself well to venture over to Glen Carbon’s more easterly side. In a much-anticipated development, the Village has announced the completion of Phase I of its Green Space East Recreational Trails Project — by far the largest and most significant portion of the development. The project spreads over a rolling, picturesque 80 acres in an area just west of Old Troy Road, east of Route 159 and in relatively close proximity to South Trace Court and the Cottonwood area. The area is designed strictly for walking, jogging or hiking - bicycling is prohibited - and includes various covered picnic table stations and approximately 9,5000 feet of quality, asphalt-covered trails. Main access points include trails at the end of South Trace Road and Paddock Lane, off the Ronald Foster Heritage Bike Trail. Visitors may park on the public roadways to access the trails.